My New Favorite Cookbook, Morning Glory Farm…and a free GIVEAWAY! This giveaway is now closed. Thank you for your interest! 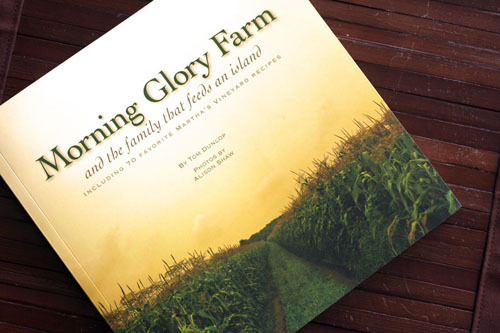 I recently received an email from Vineyard Stories, a publisher on Martha’s Vineyard, about a new cookbook called Morning Glory Farm by Tom Dunlop with photos by Alison Shaw. This email stood out for two reasons. First, I love the Cape and the Islands (Martha’s Vineyard and Nantucket), so anything related immediately piques my interest. Second, they mentioned seasonal cooking, which I am increasingly interested in. I responded to the email and they sent me a copy of the book to review.Can I just say that I am SO happy I read that email? This cookbook is wonderful and I am excited to share it with all of you. Morning Glory Farm, which is filled with lovely photography, opens with the story of the Athearn family, who own and run Morning Glory Farm near Edgartown, MA on the Vineyard. A few recipes are woven into this first section of the book, which is both interesting and endearing. Next are recipes grouped by season. The recipes that I have tried so far have been healthy and delicious with wonderful, layered flavors. The recipes are also very approachable and uncomplicated. It’s definitely my kind of cookbook. Since I like this book so much, I really wanted to share it with everyone. And what better way to share than to do a giveaway? Big thanks to Vineyard Stories for making this giveaway possible! Sounds like a great cookbook! I’m in. Exciting! If the rest of the recipes turn out as fabulous as the one in the picture, then how can I resist this book? OK, I hope I win something finally! 🙂 But, I love cooking so this would be perfect. I love the idea of seasonal cooking. Can’t wait to check out the cookbook! I want this. I moved to America just so I could win a give-away so get giving a way (to me)! ps happy birthday tmrw chica. love ya. Sounds like a really great cookbook! The acorn squash thing looks really yummy too. What a great sounding cookbook! The acorn squash looks yummy! This looks like a great book! Thanks for the chance to win. hey lady, I’d like that cookbook, please! I love the picture on the cover, can’t wait to try it! Hello, Miss Jane. What a special book. I bet it would be such a fun adventure to try these recipes from this East Coast family. Hope I win!!! MMMM . . . I buy all my veggies there when I’m on MV. You’d love it, Jayne! I love cookbooks and that looks like a fun one! I would LOVE to win that cookbook…that acorn squash looks amazing! I am a cookbook collector!!!!!! I love the idea of cooking seasonally and of course new cookbooks! I’ve been cooking seasonally – I’m going to check this out! I would judge this book by it’s cover and buy it! Would love to learn more seasonal cooking info. for those of us on the east coast. Thanks! Cooking seasonally is so wise! Love that idea! Seasonal cooking – ie fruit in the season thereof?- sounds like inspiration. Sign me up too! I need some ideas for cooking!!! Sounds great–I love reading cookbooks! Seasonal cooking is the way to go when you’re looking for the best tasting food! Looks like an interesting book. I would love a new cookbook to create new yummies! Yummy, The picture you included, the filled squash, looks sooo incredibly tasty. It looks like an awesome cookbook. Great webiste Maynard. Ohh! Seasonal cooking is definitely something I’d be interested in learning how to do more of. Count me in! Me Me! Pick Me! Miss you Jane. I would love to have this book. I can use all the help I can get in the kitchen! It looks so inviting – and my favorite hobby – FOOD! That cover is gorgeous and the cookbook looks awesome. So fun! Thanks for the giveaway and the beautiful food! Wow, this looks great. Please enter me! hey jane! love the giveaway. and this cookbook looks like a great way to start the fall off. thanks. Sounds delightful- thanks for sharing! Ooh, new recipes for Fall. Sounds wonderful. That sounds like my kind of cookbook. Thanks for the chance. This cookbook looks really good. Thanks for the chance to win! Sounds like a great book! Sign me up! Thanks for keeping me in the know Miss Jane. I love the idea of cooking by seasons. It looks wonderful. Thanks Jane. Who doesn’t love a good cookbook?! The stuffed butternut squash looks amazing! Thanks for offering a giveaway!!! This looks right up my alley!!!! Oh, I hope I win. And I am loving your site. I’m a new visitor. I love seasonal cooking! Thanks for a great cookbook idea. I love the idea of cooking with the seasons. I have to say, I love your site — I’ve visited periodically for several months now, but never commented. (Sorry) 🙂 I love your approach to simple, but effective menus and easy but yummy recipes. And the fact that you cook with your cute daughter is so cute. Mine loves to cook with me, too. Anyway, great site. Sign me up for the drawing! 🙂 Take care. you can never have too many cookbooks! Seasonal cooking does keep things fresh and I love the cover picture. Nice find. Thanks for the opportunity to win this beautiful cookbook! Sounds like a fabulous cookbook! The colors in the photo are wonderful! Yummy! Thanks for the opportunity! beautiful squash shot! I’d love to have this book.. I love to cook! I even work at a bakery. Could use a few more good recipes. Hi Jane. Great to see you the other day! This book looks really lovely! I love the sounds of this. I want to get more into cooking! I love seasonal cooking too – I’d love to be able to try some East Coast recipes! I just enjoyed my first butternut squash soup with chile of the season this afternoon. Even though I live in San Diego and it was almost 90 degrees today, I am bringing in Fall one sip at a time! The picture of the acorn squash looks amazing. I will have to experiment! Looks like a great cookbook! Thanks for the giveaway. Ah, great New England cooking. I can’t wait to go back home to New England tomorrow. I’ve been waiting for fall just so I can make some stuffed squash…one of our favorites. Thanks for doing the giveaway! I love cookbooks – especially ones that tell a story. I just bought acorn squash yesterday to do a stuffed squash recipe. For some reason, I have no luck with growing winter squashes in my garden. I am a cookbook fanatic and this one looks gorgeous! I hope I win! Sweat, blisters, and living with some interesting figures in their barn have earned me this cookbook….even if it was (gulp) 13 years ago????!!!! Wow. When did Iget so old? Looks awesome! Thanks for sharing it! I love cookbooks! This one looks awesome! Thank you! Awesome giveaway — really keeping my fingers crossed for this one!! And I can’t wait to hear more about that squash. Are you going to share the recipe? Definitely sounds like a needed edition to my cookbook library! I’m in. I don’t always cook what’s inside but this one looks like it might be used. Book looks beautiful! I’m interested! Look like some beautiful pictures and yummy recipes! i feel so greedy whenever i comment for a giveaway! 😉 i really would be super excited to win. but what can i give to you?!?! h’mmm… your blog posted on my blog. there ya go. 🙂 thanks for the giveaway! Ooo pick me pick me..I’m a New England girl!!! I love cookbooks and can’t wait to see the squash recipe! Sounds like a beautiful cookbook, I would love to win! Thanks. Sounds like a lovely cookbook! Pick me! This book looks fabulous. Thanks. I LOVE cookbooks!!!! fingers crossed! I’m usually not a big fan of fruit in savory dishes, but the photo of that squash looks so good! I’m going to have to check this book out. Oooh! I love to try new recipes!! Where have all these people come from? We need all these people to post menus next week for extra inspiration. I would take a new cook book over new shoes anyday! Thanks for the opportunity. I’m a cookbook junkie! Would love to check this one out! Beautiful cover! Can’t wait to see the inside! 🙂 Hope you are doing well! This book looks wonderful! And that recipe looks to die for…I can’t wait until next Thursday! Would love love love to try this cookbook! I would love this cookbook. It looks wonderful! Thanks for a great giveaway. I would love this cookbook! This is my first time to your site and I LOVE it!!!! I will be adding it to my favorites. Thank you! Oh this giveaway looks great!!! I’m excited to have found you blog, too. YAY! I hope I win. Hooray for learning more about cooking seasonally. That looks like a yummy book! Yes, please. I’m always looking for new and interesting cookbooks. I’m really intrigued by that squash photo. Can’t wait to see the recipe! That looks like a great cook book! Seasonal cooking would be so great to learn about. Especially since I know practically nothing about gardening. That squash looks delicious! Sounds like a great cookbook. You had me at seasonal cooking. I love the photo of the filled acorn squash! I can’t wait for all the fall squash(es?) to start showing up at the local markets. I need all the cooking help I can get, clearly. Count me in. Yum! Just in time for fall! Maybe my wife will start cooking…. Fat chance….maybe my husband will start cooking!!! Beautiful photography and delicious food? Sign me up! i always need another cookbook. thanks jane! This book looks great! I’m starting to get into gardening and am always looking for seasonal recipes. Everyone needs a new cookbook! Might just be the thing I need to remind myself that I still need to make an in-person visit to Martha’s Vineyard! This looks incredible! The photo you took is awesome! That looks like an awesome book. And that butternut squash dish looks amazing! I love the idea of cooking seasonally – and the squash dish you made looks so yummy! I am definitely interested! I am a cookbook fanatic. Thanks for the giveaway! What a great cookbook. Would make a wonderful wedding present. Well, I have enjoyed your blog for awhile now, but have never left a comment. Maybe my first comment will be a lucky winner since the cookbook looks fantastic! Whoa….that looks so good. You’ve definitely got me curious about that book! I would love that cookbook, not to mention the cape and the islands as well! This cookbook looks great! I have been so inspired to do more meal planning from your website and I love getting new ideas! Thanks! Oooh, yummy, I love trying new recipes! I would love to try seasonal cooking! Count me in. I love trying something new. I’m also interested in seasonal cooking – tastes better and saves money, I think! I love eating what’s in season. This cookbook would be helpful to us. I love Martha’s Vineyard and Nantucket!! I would love to see what this cookbook serves up! This looks so good! I looked at the index on Amazon, and there are so many delicious recipes to try!! Thank you! Please, oh please, oh please! Oh this is my kind of cookbook!! I am always on the lookout for a cookbook that has simple, delicious recipes, and cooking by season…sounds even better! I’ve always wanted to go to the cape but have not had the opportunity. Would love a new cookbook from the area. Chances are slim, but I’m always interested in a new cookbook! Thanks! Your blog is fast becoming one of my favorites! Crossing my fingers and toes to win the cookbook~~~~~~~~~!!!! Looks great! I so love new cookbooks and need to cook seasonally now that we’re in a CSA. Oh, this looks so good! I love cookbooks, and reading them cover to cover. I need something new and exciting!!! I NEED TO GET LAID and they say the way to a man’s heart is through his stomach – help me,please!! This looks yummy! I’m always ready for a new cookbook! What an awesome cookbook! I’ve just started collecting New England cookbooks — this would be a great addition. This seems like great inspiration to dig a really awesome garden next year! This sounds fantastic! Thanks for sharing. Mmmm! I need a new cookbook. This would be a perfect birthday gift for me. I LOVE cookbooks! The Vineyard is my favorite place in the world and we always go to the Morning Glory Farm Stand whenever we are there. I would love this book! A cookbooks with seasonal recipes – I like the sounds of this already. This is a great contest. Thanks for hosting it Jane! Here’s to the mighty success of Morning Glory Farm! sounds interesting – I’m in! What a wonderful cook book to have a chance to win. Seasonal cooking!! Would love to win and learn more from this beautiful cookbook. Thanks for the give-a way, Jane. I was thinking about getting a new cookbook just today. Wouldn’t it be great to win one? I love you Jane! You have inspired me many times. 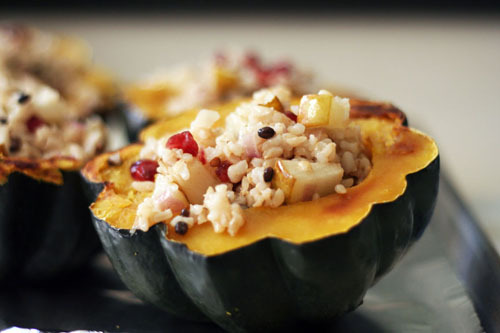 I actually recently made a wild rice-stuffed-acorn-squash recipe… looks similar to the picture. I can’t wait for your recipe. That cookbook looks great! P.S. I loved your family chili recipe. It is now my family chili recipe. I know my husband would love if I cooked some of the seasonal recipes he grew up eating. Would love my hands on this recipe book! I could use any help in the kitchen! I hope I win! I’m intrigued, what is that delicious looking squash recipe? I would love to check out the cookbook. I love the picture you took. The food looks and sounds absolutely delicious. I hope I get to be the lucky one. Cooking seasonally has been my challenge this past spring and summer! I would love a crack at that cookbook! I’m in search of some good seasonal recipe inspiration right now. The book sounds and looks beautiful! Cool cookbook – pick me! Love your blog! Someone has to win, right? Anyone would be happy with this. This is my first to your blog. I’m a New Englader and would be happy to enjoy this cookbook. What a wonderful cookbook! I would love to try some recipes! That book looks wonderful! I am hoppin in here too! I would love to win! Looks delish! I am comment number 207! That is Maine’s area code! Its a sign. Looks great & I love to collect cookbooks. I am always up for a new book! I love trying new recipes! What a SWEET giveaway. Thanks for sharing. Always up for another wonderful cookbook. just started getting a CSA box. seasonal recipes would be great!